These socks were started on my trip to Victoria, BC, and so have been dubbed the Victoria Socks. Never mind that the colorway is County Claire. What’s a few thousand miles, eh? 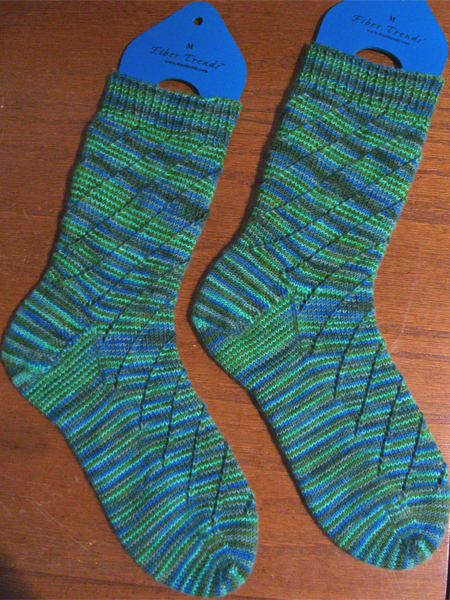 The stitch pattern is simple – K6, K2tog, YO – moved over one stitch each row so that the pattern forms a spiral around the sock. I really like the way that it looks in this yarn, and I think I will use it again. For once the colors behaved themselves pretty well. There’s a tiny little bit of pooling on the instep, but the worst of it is under the foot. I’m OK with that. And the colors did spiral on the legs. But since the color spirals in the opposite direction of the stitch pattern, I think it’s sort of cool. They fit great, too! Yeah… I really like this pair of socks. And, conveniently, fall arrived just as I finished them up, so I’ve been able to wear them.